The purpose of the ATA Awards Program is to help preserve and further the Trakehner horse in the Western Hemisphere by promoting the performance of Trakehners in breeding, dressage, eventing, hunter, jumper, driving, endurance, and other disciplines. In this way we hope to urge our members on in their pursuit of recognition in public competition. Not only will this encourage a more widespread understanding of the special qualities of the Trakehner horse, but will also provide the measurement of results that our breeders need to evaluate their work. The main emphasis of this program is on the horses themselves. All but a few of the awards are made to horses, yet the horses must have trainers, riders, and owners to reach their full potential and to show themselves properly in competition. No special registration with the ATA is needed for the Awards Program. Every Trakehner horse registered with the ATA whose owner of record is a current member at the time of determination will be eligible to receive awards. PSB Thoroughbred and Arabian horses without any Trakehner blood are not eligible for this program. The competition year runs from October 1 through September 30. At this time Canadian results must be reported to the ATA Awards Chairman by the owner on the Horse Performance Results Form by October 15. The United States Dressage Federation will provide us with all needed performance results. The horse must be lifetime registered with USDF when scores are earned and be declared with USDF as registered with the American Trakehner Association by September 30. The owner must be a USDF participating or business member when scores are earned. The United States Equestrian Federation will provide us with all needed performance results. The horse must be recorded with USEF and be identified with USEF as a Trakehner or part Trakehner. The owner must be a member of USEF and pay the hunter/jumper discipline fee and must be the same as the owner in ATA records. Results are tallied by the USEF using a points system which takes into consideration the show's rating, how many were in the class and what your placing was. Competitions must be USEF recognized. There is no minimum number of shows required. Dressage: The United States Dressage Federation will provide us with all needed performance results. The horse must be lifetime registered with USDF when scores are earned and be declared with USDF as registered with the American Trakehner Association by September 30. A copy of the horse's ATA registration papers must be on file with USDF. The owner must be a participating or business member of the USDF when scores are earned and must be the same as the owner in ATA records. 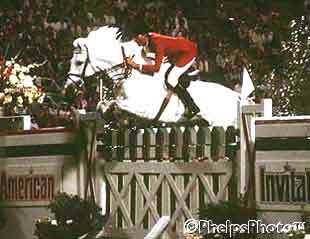 The rider must be a participating member of the USDF when scores are earned. At Training thru Fourth Levels: The horse must acquire a minimum of eight scores from at least four different judges, from at least four different USDF/USEF recognized competitions including two at 58% or higher from the highest test of the level. They must earn a median score of 60% or higher to qualify. At Prix St. Georges thru Grand Prix: The horse must acquire a minimum of four scores from at least four different judges, from at least four different USDF/USEF recognized competitions. They must earn a median score of 58% or higher to qualify. Eventing: The United States Eventing Association will provide us with all needed performance results. 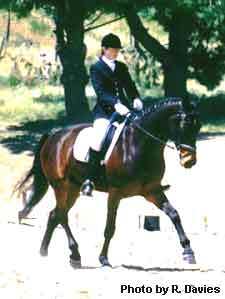 The horse must be registered with USEA and be identified with USEA as a Trakehner or part Trakehner. The rider must be a member of the USEA. The owner listed in USEA records must be the same as the owner in ATA records . Results are tallied by the USEA using a points system which takes into consideration how many were in the class and what your placing was. Competitions must be USEA/USEF recognized. There is no minimum number of shows required. Hunters/Jumpers: The United States Equestrian Federation will provide us with all needed performance results. The horse must be recorded with the USEF and be identified with USEF as a Trakehner or part Trakehner. The owner must be a member of USEF and pay the hunter/jumper discipline fee and must be the same as the owner in ATA records. Driving: The American Driving Society records results from competitions but isn't yet able to report an individual horse's show results. Results must be reported to the ATA Awards Chairman by the owner on the Horse Performance Results Form by October 15. These results must be from competitions recognized by the ADS. They will then be verified against the ADS competition results. Endurance: The American Endurance Ride Conference records results from competitions but isn't yet able to report an individual horse's show results. Results must be reported to the ATA Awards Chairman by the owner on the Horse Performance Results Form by October 15. These results must be from competitions recognized by the AERC. They will then be verified against the AERC competition results. Miscellaneous Disciplines: From time to time the Awards Committee will give Horse of the Year Awards to ATA registered horses that have excelled in other disciplines. Results must be reported to the ATA Awards Chairman by the owner on the Horse Performance Results Form by the October 15.